Some of my fondest memories are of driving in California, specifically in the Los Angeles area. And since I've lived in Phoenix for such a long time now I'll often get met with "the look" when I say that, which means "is he kidding?" No, I'm not. But it has to do with what I've always defined as driving versus what I've learned over the years driving means to most of the people I've met. 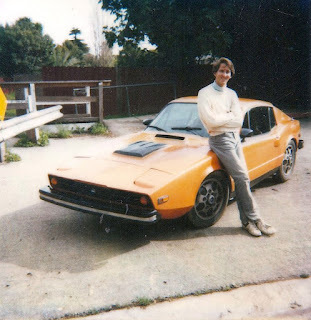 The car I owned in California was a Saab Sonett. It was fiberglass, had two seats, and was as light as a feather. It sat low to the ground, like a race car, and it was one of the most ridiculous things most people had never seen. When people looked at it, they asked me how I could carry stuff around in it, and I would just point to the driver's seat. Of course, there was no rear seat leg room, because there were no rear seats. The tiny hatchback was so low that not much could fit in there, maybe a gym bag, but not much more. It spent a lot of time on Topanaga Canyon, and Dume Canyon, and in the twisty roads behind Santa Barbara. The tires never squealed, it never "drifted", and it always stayed on its side of the center stripe. The tires, which were the very best, never lost contact with the road, never smoked, and never spun. The horsepower was all delivered to the road, and the vehicle moved like silk. The car was pure control. I describe it as more of an "Iron Man" suit than a car, and I suppose if I had ever ridden a motorcycle it would have been very similar to that. Motorcyclists, and people who had driven race cars, knew what the feeling was like. I sold it long before I moved back to Phoenix, and by that time I had a much bigger car, with four seats, and much more room to carry stuff, a Ford Mustang. And a more reliable car that could carry stuff really did make sense, and it helped me act more like a grownup. I've never really driven all that much, not the way that most of the people I know have done. I've done precious little commuting, and even though I tried to do it, I really didn't like trying to load stuff in my car at Home Depot. I've certainly never been one of those people who would drive something gigantic and fill it up with stuff at Costco. But I understand that's what a vehicle is for for most people. So I do have fond memories of driving in California, which was rarely on freeways, and rarely on city streets, if I could avoid it. I was fortunate to have jobs that were right close by, and when I left them, I headed for a twisty canyon, like Topanga. Image at the top of this post: with my Saab Sonett in 1987 in Santa Barbara. That car was meant for fun, not work!